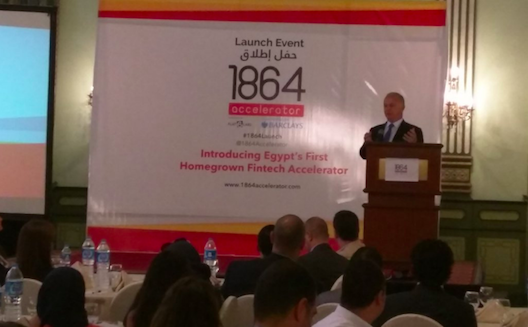 Yesterday Cairo-based Flat6labs announced the launch of a new fintech incubator, the 1864 Accelerator in cooperation with Barclays Bank in Egypt. 1864 Accelerator will provide different types of support for entrepreneurs, including seed investment of 150,000 Egyptian pounds (US$16,900), and was named after the year Barclays Bank launched in Egypt. “We have raised the regular funding amount by 50 percent while keeping our share in the company between 10 and 15 percent,” Flat6labs CEO Ramez Mohamed told Wamda. Flat6Labs will provide the training programs, workspaces, trainers and mentors for entrepreneurs, and help with technological development and legal procedures. Barclays will sponsor the acceleration programs and cover the costs of operation and training boot camps. “The bank provides networking opportunities with global investors for the Egyptian companies in the acceleration programs, through its various acceleration networks in London, New York and Cape Town,” said Barclays business development director Soha El-Turky. “We look forward to receiving creative ideas in all the areas of the fintech sector but we will certainly adopt the ideas that serve the banking sector, especially because we desperately need innovations that support us in providing services to our customers and bring in more of them,” he said. The program is receiving applications from startups in Egypt and abroad here for the next two months. Global investments in fintech grew by 75 percent in 2015, or $9.8 billion, and in the first quarter of 2016 that hit $5.3 billion. The launch of the accelerator coincides with the appointment of Willy Amin as director of Flat6labs Egypt. Amin has worked as an executive director of HelloFood, a company of Rocket Internet (which acquired Otlob.com last year). “Even though we are expecting around 60 applications, we will only accept 10 applicants to join the accelerator. We will announce a fintech hackathon and awareness sessions for entrepreneurs during the next two months until the application deadline,” Amin said. The acceleration program is for 14 weeks, and the graduating companies will be announced on December 10. The program will accept applications in several areas of the financial sector including crowdfunding, peer to peer lending, financial services for SMEs, digital payment, digital invoicing and alternative banks. According to Amin, the biggest challenge they will face in the Egyptian market lies in entrepreneurs clinging to their thoughts, a bit too much sometimes, which makes them hang on to a business model that is not always optimal for attracting foreign investments. Watch the following video for more information about 1864 Accelerator.